Our goal: We were looking for a community-driven network that provided accurate information so we could stay on top of the changes going on with social media. We were also looking for training that was relevant so we can keep our clients ahead on any network they are focused on. One other goal was to collaborate with others. 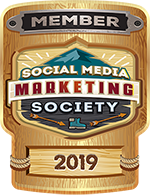 The Social Media Marketing Examiner is well-known for its content covering social media and how-tos. They have an annual conference “Social Media Marketing World” which is phenomenal. We haven’t had the opportunity to go in person but have purchased the virtual ticket for the last couple of years. The content shared is priceless and has allowed us to implement an effective strategy for our clients as well as for our own social media efforts. We look forward to learning and contributing to the society and bringing the most up-to-date strategies to our clients and followers.